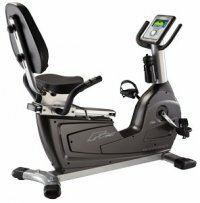 The BODYCRAFT R25 is a remarkable semi-recumbent bike! Its small size belies the commercial quality construction. Its easy-to-use, two-color display provides 3 Heart Rate Controlled Programs (Chest telemetry strap included), 12 Preset Programs, Manual operation, and 4 Memory Banks so you can custom-design your own workouts. Infinitely adjustable to fit almost every size user, yet only 48 inches long!